Yesterday GoodCarBadCar.net published 45 new auto brand sales results pages to go along with three auto market size results pages which were published on the weekend. In addition to all the models for which you’ve been able to source sales figures over the past year, these new posts allow you to easily locate historic monthly (going back to January 2010) and yearly (going back to 2002) sales figures for every current brand and every overarching manufacturer. This means you can find data for the Ford Focus, Ford brand, and the Ford Motor Company. 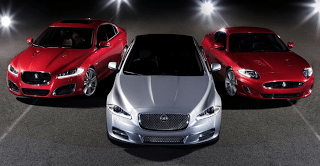 Or the Jaguar XJ, Jaguar brand, and Jaguar-Land Rover. Or the Porsche Boxster, Porsche brand, and the Volkswagen Group. You get the picture. For users of desktops, laptops, and tablets, this information can be sourced through the dropdown menus at the top right of this page. Begin by selecting a Make – which brings up options for total market size and corporations, as well – and then a second menu will load. Now you’re offered specific models, the brand total, and the overarching manufacturer’s total, as in the case of Jaguar and the JLR group. The Corporations group fills up with eleven different automobile manufacturers, from the BMW Group through to the Nissan Motor Company and finally the Volkswagen Group. As already mentioned, you can also select the total market size for Canada, the United Kingdom, or the United States. UK data reaches all the way back to 2000. For all users, including those who read GoodCarBadCar on their smartphones, the Sales Stats page offers this very same dropdown menu function. It can be used the same way. That page may look a little different now, however. Previously there were also menus in which you could find, for instance, the U.S. Auto Sales By Brand post from February 2010 and the Canada Commercial Van category. Those menus still exist on GoodCarBadCar, but they’ve moved to The Tally page. The Sales Stats menu allows you to see how one vehicle has fared over the course of the last decade or so. The Tally page is where you’ll find posts which compare vehicles in their respective categories, and in the case of the All Vehicle Rankings, with every other vehicle on sale. As before, the Best Sellers page offers links to every best seller post on GoodCarBadCar and provides links through myriad dropdown menus to brand rankings posts and worst sellers rankings. These are small changes, but changes we hope will make it easier for you to find the information you require. For Internet Explorer users who had been having trouble utilizing the Sales Stats dropdown menus, we apologize. Feel free to contact Timothy Cain in the future with any problems you might be having in your quest to locate specific automotive sales data. Oh, as a general life principle, use Chrome if you’re on a PC. Tomorrow is one of the twelve most important days in this niche publishing industry’s year. U.S. and Canadian divisions of every automaker report October and year-to-date sales figures. There’ll be brand rankings, U.S. best seller lists, and updates to all 330 Sales By Model posts as described above.